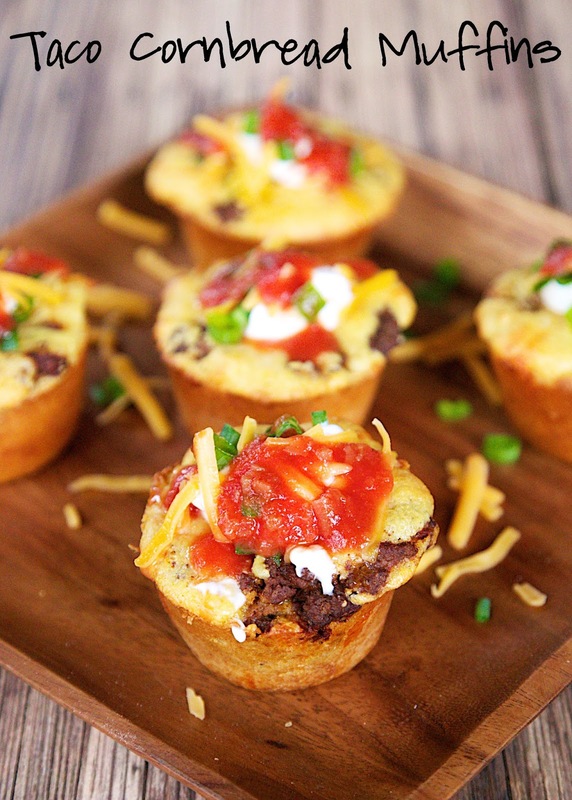 Taco Cornbread Muffins Recipe - cornbread muffins stuffed with cheese, taco meat and salsa. Top with your favorite taco toppings! Ready in under 20 minutes. LOVE quick Mexican recipes! The kids gobbled these up (adults too!)!! We are big fans of cornbread casseroles. We have several on the blog. I was going to make our favorite Taco Cornbread Bake and thought why not make individual Taco Cornbread Muffins? I used a couple of packages of Martha White Sweet Yellow Cornbread and Muffin Mix and whipped up some taco meat. The muffins were on the table in under 30 minutes! We absolutely loved these Taco Cornbread Muffins. They were delicious and a lot of fun to eat! I really liked the hint of sweetness from the cornbread mix. We topped the muffins with sour cream, cheese, green onions and salsa. If you are looking for a shortcut, you could definitely make the taco meat ahead of time and refrigerate or freeze it until you are ready to bake the muffins. You can also freeze the leftovers for a quick dinner later! The 19th Annual Martha White®/Lodge Cast Iron® National Cornbread Cook-Off on Saturday, April 25, 2015, will look a little different this year. Instead of calling for entries, past grand prize winning recipes have been judged internally and narrowed down to the top 10. These past winners will be returning to South Pittsburg, TN to compete against the best of the best at this year’s All-Star Cornbread Cook-Off. In honor of the upcoming Martha White®/Lodge Cast Iron® National Cornbread Cook-Off, I am participating in a Virtual Cornbread Potluck with 10 other fabulous bloggers! The folks at Martha White want to give one luck Plain Chicken reader this awesome prize pack! (If you are viewing this in a reader or in email, you will need to come to blog to enter. In a skillet, cook ground beef or turkey until brown. Drain fat. Add taco seasoning and water to cooked meat. Simmer for 5-10 minutes. Stir in 1/4 cup of salsa. Set aside. In a bowl, mix together cornbread mix, milk, eggs and 1 cup shredded cheese. Pour mixture into greased muffin pan cups, filling 2/3 full. 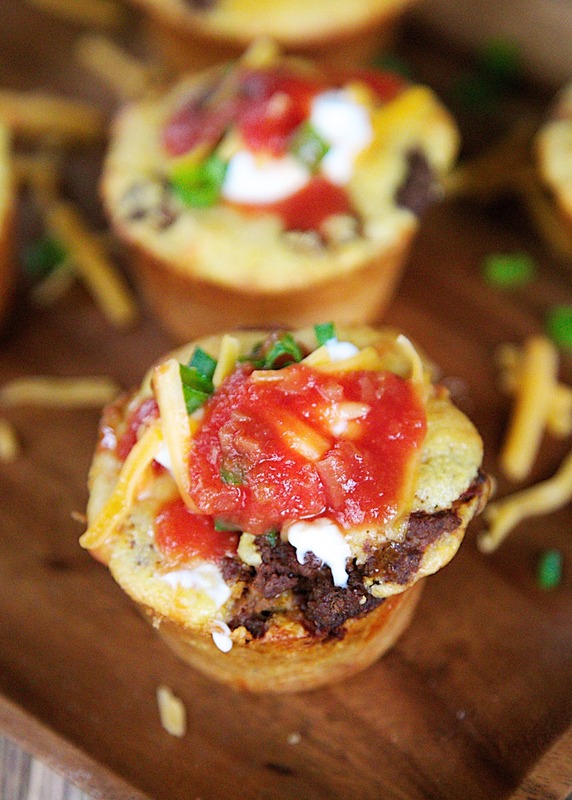 (you may have some leftover batter) Top each muffin with taco meat. Bake for 16-19 minutes, or until golden brown. Top with sour cream, cheddar cheese, green onions and salsa. Awesome giveaway and recipe sounds yummo! These cornbread muffins look so good Stephanie! Can't wait to try them! I love the idea of making these into muffins! Loose your taco cornbread muffins Stephanie!! My family would love them! This is great! Perfect size for lunches! My family will go bananas over this! Thanks so much for sharing! My family enjoyed it. Thanks for a great corn muffin recipe! What a great idea for taco lovers too.....Cornbread is great to stretch the meal a little further and so delicious in place of tortillas too. I'm going to try this soon!